As I trotted behind my guide along the trails that Jack London once rode, I imagined myself as one of the many friends he led on horseback rides through his 1,400-acre Beauty Ranch in the early 1900s. We galloped through stands of eucalyptus, madrona, and towering redwood trees that shaded fern-filled glens just as Jack described them in his novel The Valley of the Moon. Delighted with each new vista I, too, felt “vitalized, organic” as I overlooked vineyards in their tidy rows stretching to the foot of the purple Sonoma Mountains. We cantered over a rise to see the lake that Jack and Charmian, his wife of eleven years, swam in on sunny afternoons. I saw myself gliding with them through the clear water then drying on a hot rock in the sun, cooled by the wisp of a breeze. Like young Jack London, I went from California to the Northwest while in my teens. Unlike Jack, it was not my idea of a great adventure. My parents, determined to homestead in Haines, Alaska, rudely uprooted me and took me to a world populated by loggers, fishermen, and Tlingit Indians. At thirteen, I hadn’t read Jack’s White Fang or The Call of the Wild. I didn’t know I was walking in the famous author’s footsteps when I took the narrow gauge train that snakes up the Whitehorse pass into the Yukon. I had no idea it was the alternate route for the Chilkoot Trail Jack climbed carrying 150-pound pack during the Gold Rush of the 1890s. A decade after my family’s shift to the North, Hollywood chose to use the more accessible Dalton Trail from Haines to the Klondike to re-enact the fabled climb of the stampeders up the ice steps of the Chilkoot Trail in the movie White Fang. Every able-bodied person in my hometown was hired to re-create the famous scene Jack described. 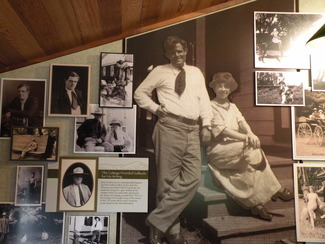 Even then, while everyone in town swaggered about bragging about his or her role in the film, I still had no personal awareness of Jack London. He was simply an adventurer who captured the grit of the Northwest in children’s books.